Shoe height has historically reflected nobility, authority, and wealth. France's King Louis XIV (1638-1715) was only 5 ft 3 in (1.6 m) tall until he donned specially-made high-heeled shoes with curved heels constructed of cork and covered with red-dyed leather, with the red color symbolizing nobility. On special occasions, his 5 in (12.7 cm) high heels were ornamented with hand-painted scenes of his military victories. Today, curved heels preserve his legacy and are known as Louis or French heels. Other heel-wearers used their footwear to boast of their wealth; the heels were so high that servants had to break them in, so to wear high heels also proved one could afford servants for this task. Today, heels are blessed for the elegance they lend to the wearer's appearance and cursed for the damage they inflict on ankles, calves, and backs. The need to gain height above the ground may have originally been inspired by the weather and street conditions rather than money or vanity. During medieval times, special wooden soles called pattens were attached to the bottoms of fragile, expensive shoes made for wearing indoors so they could be kept out of the mud and damp when converted for outdoor use. Pattens were elevated in the heels and under the ball of the foot so the wearer could walk more easily by rocking forward on them; these shapes clearly foretold of high heels. The entire shoe was elevated in the style called the chopine that originated in Turkey in about 1400. These shoes were effectively miniature stilts that were flat on the bottom and made of cork and covered with leather or fabric. The wearer slipped her feet into the tops that were open-backed slippers called mules or straps similar to sandals. Chopines were typically 7-8 in (18-20 cm) high, but, in the extreme, they were as much as 18 in (46 cm) tall. Chopines kept the wearer's skirts out of the mud, assuming the lady could walk at all. When the style became fashionable in sixteenth century Venice, chopineshod ladies walked with a servant on either side of them so they wouldn't fall. The ladies loved the attention and the additional height, but chopines were so restrictive that women were also forced by their footwear to stay at home. The 18 in (46 cm) extreme was reached in France and England where the fashion spread from Italy. Catherine de Medici (1519-1589) is credited with wearing the first true high heels and with taking the style to France in 1533 when she married the Duc d'Orleans, who was to become France's King Henry II. Italian designers created the high heel by modifying the chopine to eliminate its awkwardness while still raising the height of the wearer. A cork wedge was placed under the front of the shoe, with a high section under the heel. These high heels served vanity another way by making the feet appear smaller and the arch of the foot higher; both of these physical attributes were considered signs of noble birth. Catherine's Italian style was quickly adopted by the French court. The French Revolution caused a revolution in footwear as well, and many shoe fashions vanished temporarily in the name of democracy. The red heels of the nobility disappeared completely, and showy buckles and rosettes were replaced by ribbon or cord ties. Flat shoes or very low-heeled shoes known as pumps replaced the arrogance of high heels, although high-heeled shoes and boots were restored to respectability by the mid-1800s. Until high heels were invented, shoe soles for the left and right feet were identical and were called straights; shoes were formed on a single mold, called a last, for both feet. Shoes were bought not as a pair but as two single shoes of matching size and style. The arch shape of high heels, however, required different soles for the two feet, so, from 1818 onward, lasts were designed specifically for the left and right foot, and shoes were sold in pairs. Early pairs of shoes were termed crookeds, as opposed to the old-fashioned straights. The high-heel portions were originally made of wood or cork and were up to 6 in (15 cm) high. The French called them chaussures a port or bridge shoes, because of the open arch, or chaussures a cric, meaning clicking shoes for their sound. Usually, heels on men's shoes were larger in shape and heavier. The extreme heights of narrow heels were popular among gentlemen as well as ladies, and eighteenth century Englishmen who wore 6 in (15 cm) high heels usually walked with canes to be able to walk at all. After World War II, the high heel regained its popularity primarily because of the growth in consumer spending and the variety and availability of designs produced. Stiletto heels, named for the narrow-bladed knives, soared into fashion in the 1950s. These 4 in (10 cm) spiked heels narrowed to pinpoints; they were made possible by seating a thin metal rod in the broader part of the wood or plastic heel that was attached to the shoe. A plastic tip was attached to the metal end, but these tips often fell off causing floors to be gouged and carpets to be ripped. Some office buildings provided overshoes for women to wear over their stiletto heels to prevent this damage. In the 1960s, stiletto heels were attached to 'wet-look' boots that enhanced the effects of miniskirts. Today's designers experiment with every material and type of ornamentation to create and embellish high heels. Heels have even been made of the lightweight aluminum used to manufacture airplane fuselage to give them strength in slender shapes. Raw materials for the manufacture of high heels include plastic, leather, wood, fabric, animal hides, paper (for patterns and labels), and various cements and glues, depending on the component materials. Nails, screw nails, and tacks are used to hold fabric or leather in place and to attach heels to the shank of the shoe. Fabric and feathers, tree branches and sequins, faux pearls, and genuine diamonds have all been used to decorate high heels. High-heel designers may be employed by the shoe manufacturer, or, more likely, are independent designers (sometimes connected to well-known fashion houses) who contract with the manufacturer to produce designs or lines of shoes bearing the designer's name. Designers work very closely with the master shoemaker who oversees the practicality of all designs for the shoe manufacturer. The designer may have an image or style to convey and a particular choice of materials, and the master shoemaker tells the designer what can be made or what production limitations are involved in the design. For example, the height of the heel may be restricted by the overall shape of the shoe or the number of stitches needed to make the shoe may affect its finished appearance (or may be impractical to manufacture). The designer and master shoemaker exchange ideas over the course of several months before they arrive at a satisfactory design. 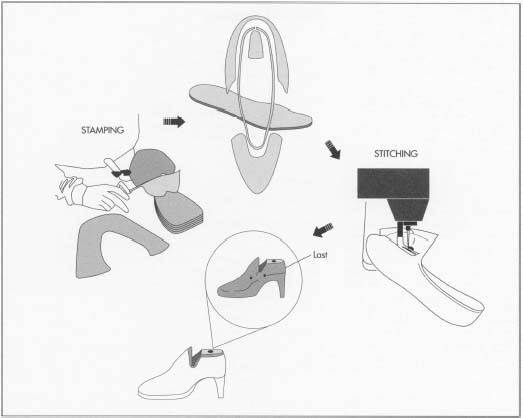 The first step in high heel manufacture involves die cutting the shoe parts. Next, the components are drawn into a machine equipped with a number of lasts—a shoe mold. The parts of the high heel are stitched or cemented together and then pressed. Lastly, the heel is either screwed, nailed, or cemented to the shoe. by the computer. The completed designs and templates are copyrighted and registered by the designer and manufacturer. 1 Although most shoes today are mass-produced, handcrafted shoes are still made on a limited scale especially for performers or in designs that are heavily ornamented and expensive. The hand manufacture of shoes is essentially the same as the process dating back to ancient Rome. The length and width of both of the wearer's feet are measured. Lasts—standard models for feet of each size that are made for each design—are used by the shoemaker to shape the shoe pieces. Lasts need to be specific to the design of the shoe because the symmetry of the foot changes with the contour of the instep and distribution of weight and the parts of the foot within the shoe. Creation of a pair of lasts is based on 35 different measurements of the foot and estimates of movement of the foot within the shoe. Shoe designers often have thousands of pairs of lasts in their vaults. 2 The pieces for the shoe are cut based on the design or style of the shoe. The counters are the sections covering the back and sides of the shoe. The vamp covers the toes and top of the foot and is sewn onto the counters. This sewn upper is stretched and fitted over the last; the shoemaker uses stretching pliers to pull the parts of the shoe into place, and these are tacked to the last. Soaked leather uppers are left on the lasts for two weeks to dry thoroughly to shape before the soles and heels are attached. Counters (stiffeners) are added to the backs of the shoes. 3 Leather for the soles is soaked in water O so that it is pliable. The sole is then cut, placed on a lapstone, and pounded with a mallet. As the name suggests, the lapstone is held flat in the shoemaker's lap so he can pound the sole into a smooth shape, cut a groove into the edge of the sole to indent the stitching, and mark holes to punch through the sole for stitching. The sole is glued to the bottom of the upper so it is properly placed for sewing. The upper and the sole are stitched together using a double-stitch method in which the shoemaker weaves two needles through the same hole but with the thread going in opposite directions. 4 Heels are attached to the sole by nails; depending on the style, the heels may be constructed of several layers. If it is covered with leather or cloth, the covering is glued or stitched onto the heel before it is attached to the shoe. The sole is trimmed and the tacks are removed so the shoe can be taken off the last. The outside of the shoe is stained or polished, and any fine linings are attached inside the shoe. 5 The design developed by the master shoemaker and designer can be mass-produced from the components committed to fiberboard masters or from computerized data. If metal dies are used to cut the pieces, leather (or other material) is fed into a 20-ton (18-metric-ton) press that has been equipped with one or more dies, and the pieces are punched out. The process is even more simplified when a computer-controlled laser beam is used to cut the pieces out. 6 When all the components are cut out, the material is drawn into a machine equipped with a number of lasts. The machine pulls the piece of material tightly over the last, and thermal cement is used to hold it together temporarily. Before synthetic adhesives were widely available, tacks were used exclusively. Now, only a few tacks may be needed along with the adhesives. High heels are made in three separate sections—the sole, the upper, and the heel. When the components have been assembled or stitched by computer-controlled machines into each of these three sections, the sections are conveyed to another machine for assembly. Strong cement is used to bond them together, and they may be put in a press for approximately 15 seconds to press the cemented pieces firmly. 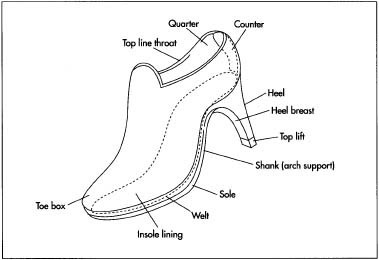 7 The heel itself may be attached to the shank of the shoe using nails, screw nails, tacks, cement, staples, or sets of molded prongs (or some combination), depending on the style of the shoe, the height of the heel, the materials used in construction, and other factors including cost. Nine out of 10 heels are made of plastic and covered with material to match or compliment the shoe uppers. Plastic is used because it is light-weight and inexpensive. 8 After the sections are bonded to make the finished shoe, labels and stamped size notations are added to the insides of the shoes. The completed pair of heels is stuffed and wrapped with tissue paper and put in an appropriately labeled box. Cartons of boxes of the same style of shoe are packaged and prepared for shipment to the retailer. Although the mass-production of high heels is now done largely by machine, quality control personnel oversee all aspects of design and production. Materials are carefully inspected when they are received so that imperfect leathers, badly dyed fabrics, and other faulty items can be returned to suppliers immediately. Components that may be made by outside suppliers, such as wooden heels, are also inspected and accepted or rejected. During an initial production trial, the sections cut and assembled by computer are compared to design details and examined for flaws. When production is approved, quality control engineers also monitor all facets of production and spot-check components and completed sections and shoes. Testing laboratories are also used to evaluate the quality of materials before they are incorporated in the construction of shoes and for testing the durability of finished models in the prototype stage. Depending on the style, finished shoes may be polished or treated, and these steps are also carefully inspected. Boxed shoes may be opened and randomly checked before shipment. The use of computer-aided design and precise machines such as lasers has greatly limited the waste from shoe production. The waste that does result must be disposed and may contain synthetic adhesives and other materials that prevent recycling. Plastic waste can be remolded. Byproducts usually do not result from the manufacture of high heels, but makers often market matching products like handbags. By fitting pieces from several types and sizes of product onto a single piece of leather, for example, waste is further reduced. Although high heels may be considered a modern fashion statement, their history proves that they have existed for centuries and will continue to do so. Wearers have followed King Louis XIV s example and have seen that heels can enhance height and flatter appearance. The heights and styles may change from season to season, but the high heel in some form is sure to be part of fashion's future. Lawlor, Laurie. Where Will This Shoe Take You? A Walk Through the History of Footwear. New York: Walker and Company, 1996. Nichelason, Margery G. Shoes. Minneapolis: Carolrhoda Books Inc., 1996. O'Keefe, Linda. Shoes: A Celebration of Pumps, Sandals, Slippers & More. New York: Workman Publishing, 1996. Wilson, Eunice. A History of Shoe Fashions. New York: Theatre Arts Books, 1968. Yue, Charlotte and David. Shoes: Their History in Words and Pictures Boston: Houghton Mifflin Company, 1997. Iverson, Annemarie. 'Manolo Blahnik.' Harper's Bazaar (July 1997): 110. Action Shoes of India. http://www.action-shoes.com/process.html .